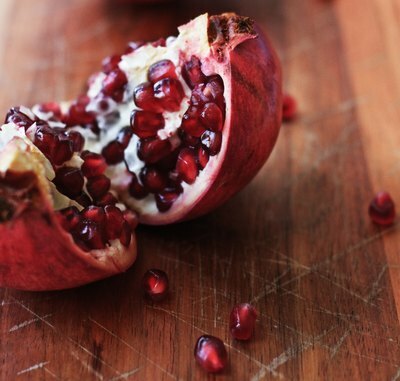 1 Make a thin slice on the bottom of the pomegranate: With a sharp knife, slice 1/4-inch off of the stem end of the pomegranate and place the pomegranate cut side down on the cutting board to stabilize it.... How To Remove The Seeds (Arils) From A Pomegranate: Cut the 1/2? off the top crown of the pomegranate where the stem is, and set aside. Using a small knife, run the knife down the pomegranate skin along white pith to the bottom, but not through the bottom center of the pomegranate (this keeps it held together for next step). Slice of a fresh pomegranate cut open to show the seeds and pulp on a white background.